The foundation stone of the new church now building at Port Arthur, was laid with due ceremony by His Excellency during his recent visit to the settlement. 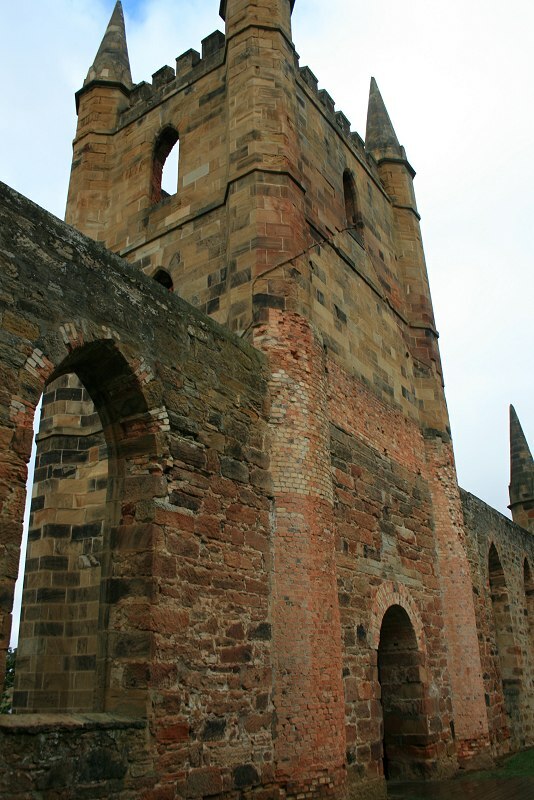 Necessary repairs are being effected by the Government to the century-old church at Port Arthur. The foundation stone of this historic structure was set by Lieut.-Governor Arthur on April 25, 1836, and the first service was held on July 26, 1837. In 1875, during a heavy gale, the long, tapering steeple, which crowned the tower, was blown down. 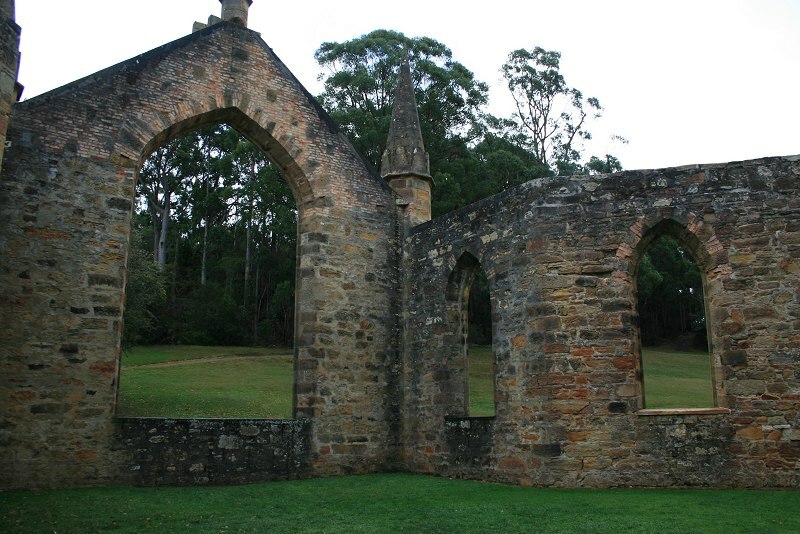 Some years later a bush fire destroyed the interior fittings, roof, doors, and windows. 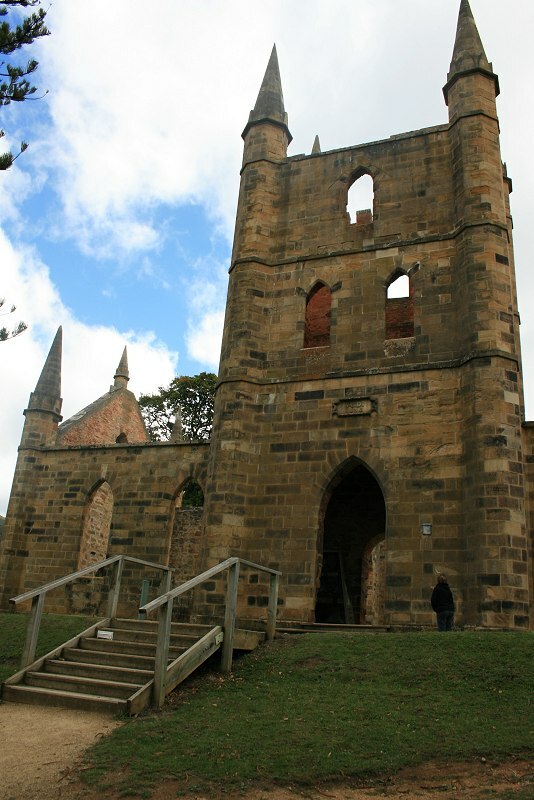 The Port Arthur bells are the oldest chime of bells in Australia. 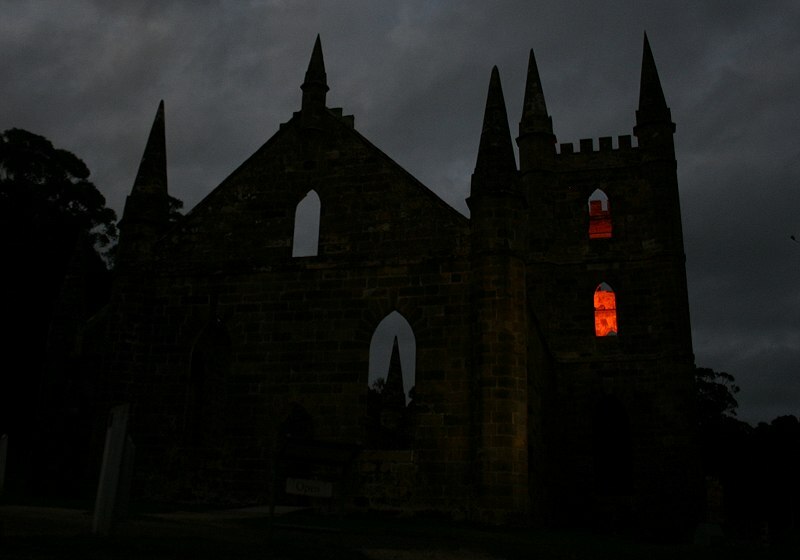 Following the closure of the Port Arthur Penal Settlement in 1877, the church bells were stored in the New Norfolk Asylum. In 1897, seven of the bells were handed over to the New Norfolk Municipal Council who hung them in St Matthew’s Church tower. The eighth bell disappeared. 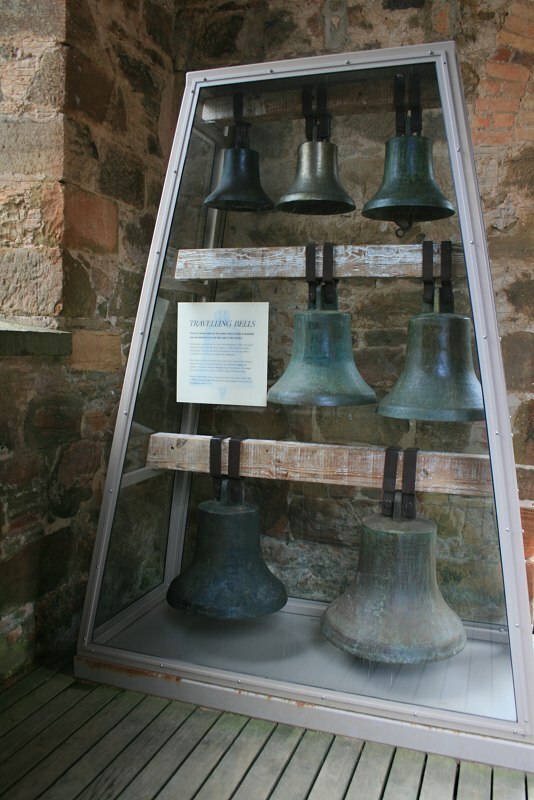 Shortly after 1906 the bells were split up and hung in various other Derwent Valley churches. All would have stories to tell. The second biggest bell crashed to the ground when the Maydena Church burned down. The largest bell was returned to the Port Arthur in 1928 to hang in the model prison. When the New Norfolk Council returned six bells to Port Arthur Historic Site in 1995, the missing eight bell had still not been location. If you know of its whereabouts, please tell us. This place has its ghost stories, including that of a prisoner who was digging the foundations when another attacked and killed him with a pickaxe (that’s an account of the trial). 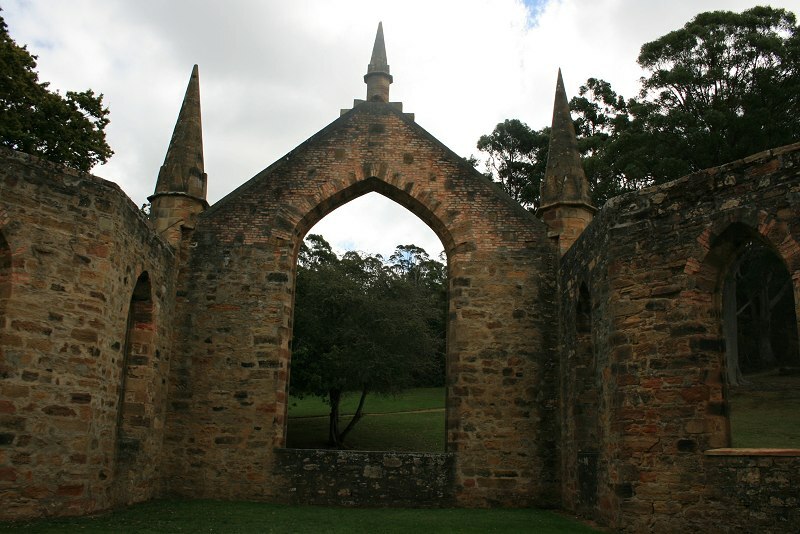 To-day is the centenary of the foundation of the church at Port Arthur. 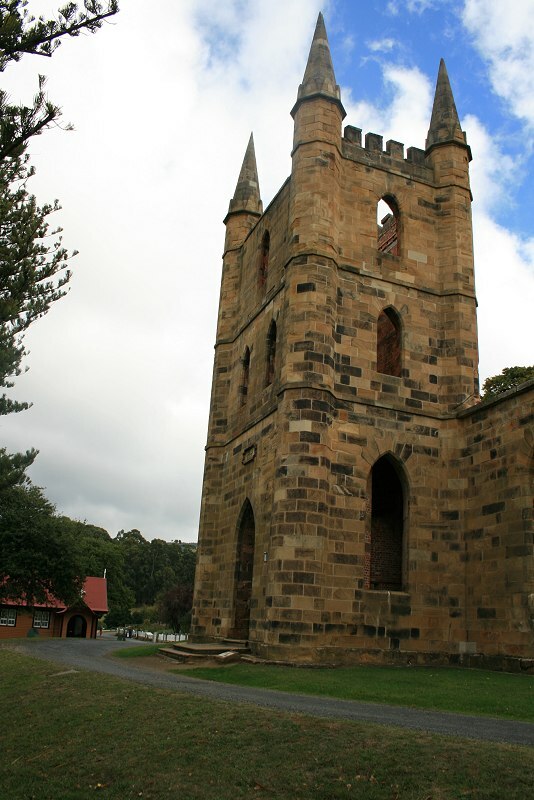 The foundation stone was set by the Lieutenant-Governor of Tasmania, Colonel(afterwards Sir George) Arthur, on April 25, 1836, and the first service was held in the building on July 26, 1837, although it was still unfinished. The church was completed in 1838, but it was never consecrated. Prior to its erection, services held at the penal settlement were conducted usually at the mines. There was, however, a chapel at the Model Prison. Captain O’Hara Booth, one of the early commandants at Port Arthur, in his journal, which was brought to light by the late Mr. R. W Giblin, in the entry for April 25, 1836 recorded that the setting of the foundation stone was followed by a discourse by Mr. Simpson, the Wesleyan missionary at the settlement. In a later entry Captain O’Hara Booth referred to a visit from Dr. Browning, a Church of England minister, on October 2,1836. 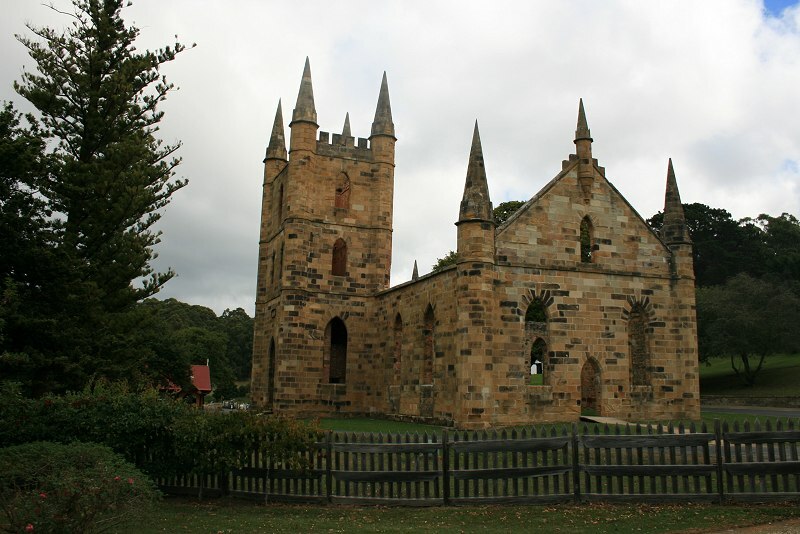 It is believed that the church was designed by a convict. 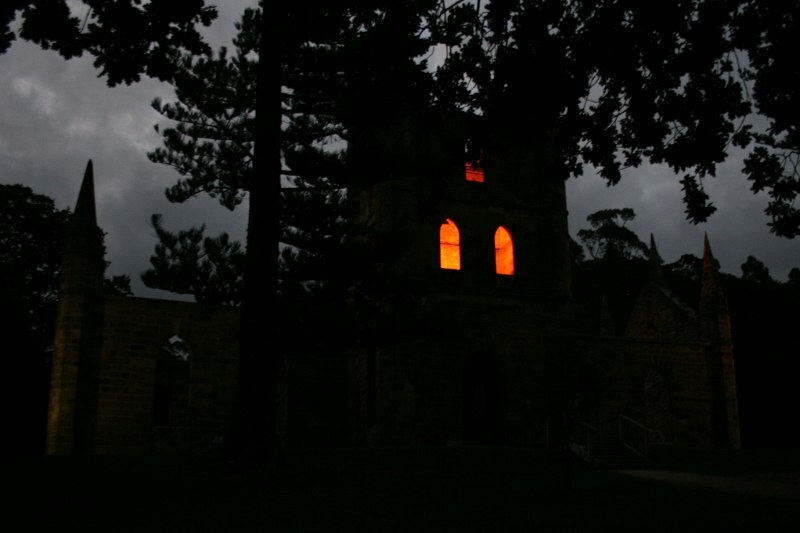 It possessed not only clock tower and steeple, but also a peal of bells. When Port Arthur was closed in 1877 the peal of bells apparently was taken over from the church by the district council when the Rev J. Oberlin Harris was rector of New Norfolk he secured the loan of a peal of church bells from the Port Arthur Council for use at St. Matthew’s Church, New Norfolk the bells were installed in the upper part of the tower in 1897, and were in use for a number of years. They were subsequently returned to the council. 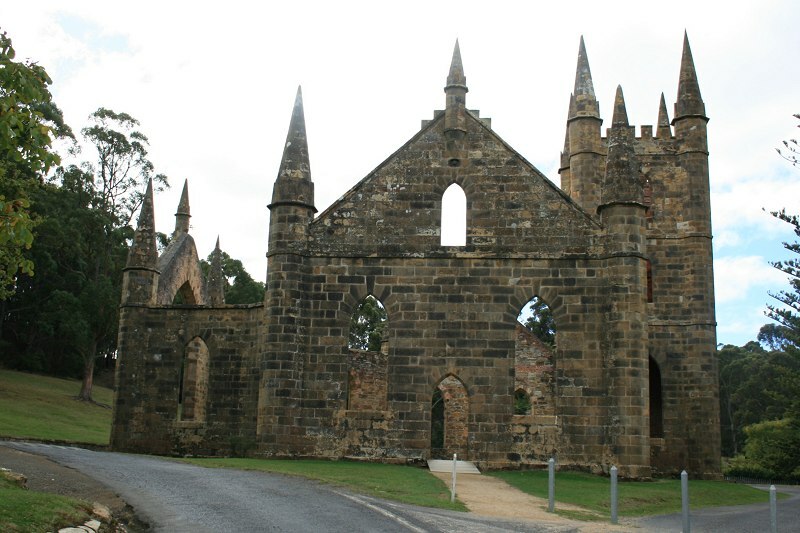 During the 70’s bush fires broke out in the Port Arthur district and these, it is thought, were responsible for the destruction of the church. The steeple was blown down in about 1874 or 1875. 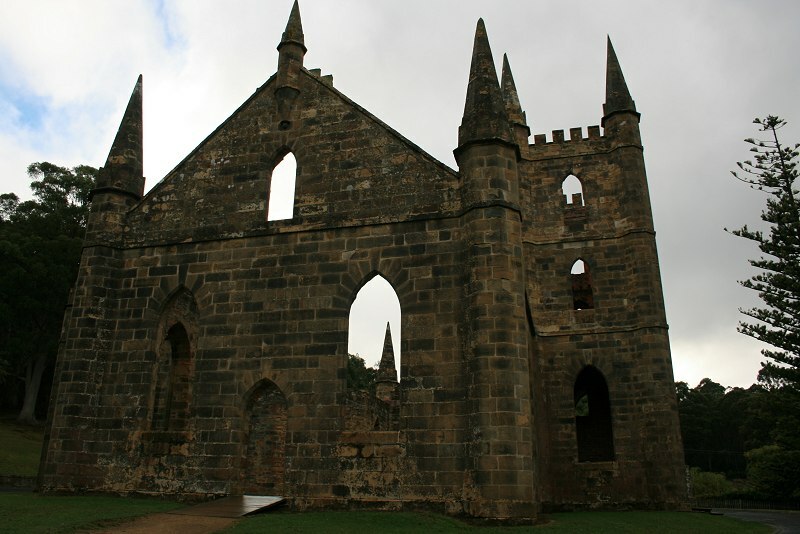 On the nomination of Mr Durham by your Lordship to Port Arthur, the present Chaplain, Mr Manton would immediately be displaced; and the very rumour of it, created a sensation there, which has been attended by important consequences. 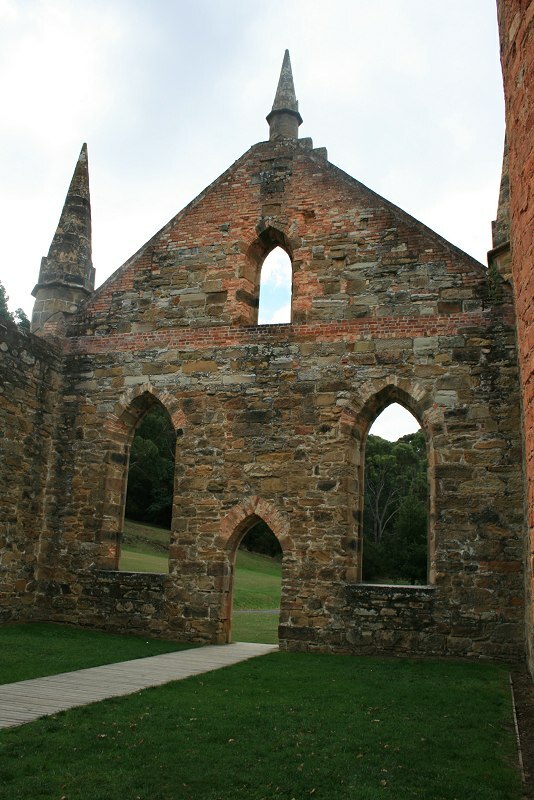 Hitherto all denominations of Christians, whether Presbyterian, Wesleyan, Independent or Roman Catholic, have been satisfied in attending one common place of worship at Port Arthur, so long as no decided ensign of any particular creed was erected. But now that a Church of England clergyman is to be established there, and a Church consecrated accordingly, all of these different creeds inform us they cannot conscientiously attend the Church of England service. I need not trouble your Lordship with an account of the gradual steps, which the convicts have taken to get themselves exonerated from attending the Church Service; suffice to say that on Sunday the 4th October last, one hundred and eighty-five of the convicts at Port Arthur refused to go to church. This Emeute was put down by the judicious conduct of Capt Booth the Commandant, who at once acceded to their religious scruples, and kept them in a room by themselves, with proper books at their disposal, during the time of Divine Service. 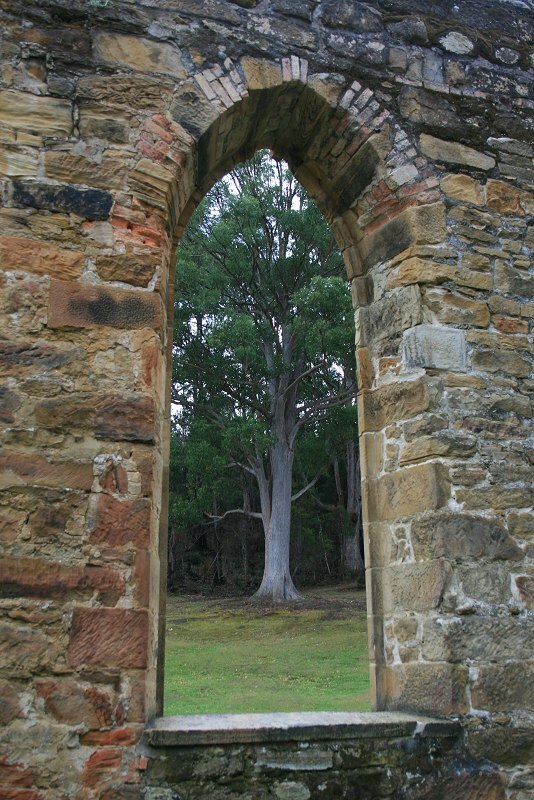 This entry was posted in Church: Non-denominational, Port Arthur, Tasman Peninsula and tagged from LJ, original postcard, ruins by Monissa Whiteley. Bookmark the permalink.